We are inviting bright minds to meet, learn and innovate at sea. This will be a unique opportunity to be at sea with a like-minded, yet diverse group of entrepreneurs, investors, community builders, domain experts and other brilliant people. 1) We set sail from Oslo at 5pm on Sunday 2nd September arriving in Copenhagen on Tuesday 4th September for our first trip (Sold Out). 2) We sail from Copenhagen (Helsingør) 8th of September, arriving in Oslo early morning 10th September for our second and return trip. We invite you to join the EntrepreneurShipX voyage to get a new perspective and deeper relation to your fellow tech and entrepreneurship community. We guarantee a voyage filled with both intellectual and physical challenges, that all can master and learn from. Once docked in Copenhagen, you will have the option to stay onboard for a few days while you attend the various Techfestival events (for a reasonable price). byFounders are hosting EntrepreneurshipX while docked in Copenhagen, and will organize a number of activities during the week like the byFounders End of Summer Party that all are invited to. On Friday 7th September the ship is being used for a private event and will sail the short distance from Copenhagen to Helsingør, where byFounders will hold an invitation-only gala dinner. We meet at Copenhagen Central Station at 7:00 am 8th September, as the return trip will depart from Helsingør at 9:30, arriving back in Oslo early on Monday 10th September. The embarkment for the return journey begins at 8:00 am. It's an easy quick train journey from Copenhagen to Helsingør. Please register your interest for the outbound trip, the return trip, or both trips and let us know if you wish to stay onboard whilst docked in Copenhagen. It promises to be an epic journey! The outbound and inbound voyages each cost € 330.00 per person. This covers food, lodging and any ship related costs. Sign up to the list! There are limited spaces on the ship, so sign up now for the chance to take part and join our group of pre-selected sailors. In true 'pay it forward' spirit, those who share our philosophy of taking part in the voyage with like-minded individuals, are preferred. Let us know the name of a bright mind that you think should join you on this epic voyage! Thank you for showing an interest in joining us on this unique voyage! As there are limited spaces on the ship, we will select the brilliant minds who will form our crew in due course. You will receive an email from us when that time comes with details of the next steps. So stay tuned! The EntrepreneurShipX Christian Radich is a 62.5M long Norwegian, full-rigged three-masted ship. She was built as a school ship in 1937, and is one of the finest ships ever built. She is also a metaphor for business. Entrepreneurship can’t be taught in school, you learn it by doing it. The same goes for sailing. It’s all about working with the elements, building strong teams, enjoying the journey and being flexible about the path you need to take to get to your end goal. Value based entrepreneurship is founded on 'paying it forward’. We share knowledge, guide those who may benefit and make connections others could not - all in the spirit of contributing towards something larger than oneself, that has value for the many, not the few! We need to teach and practice Value Based Entrepreneurship and Impact Investment, to build the businesses that equip us to solve the challenges that lie ahead. Please ensure you bring some warm clothing and a waterproof outer layer. Hope for the best, prepare for the worst! You will need to bring a sleeping bag and a towel. The ship has a few spare – just in case! Voyage 1: Embarkation starts at 16:00 on Sunday 2nd September. The ship will be docked at Akershusstranda 9, 0150 Oslo, Norway. Voyage 2: Embarkation starts at 8:00 am on Saturday 8th September. The ship will be docked at Havengade 1, 3000 Helsingør, Denmark. How do I get to Helsingør from Copenhagen or the Copenhagen Airport? If flying into Copenhagen Airport, there is a direct regional train from the airport to Helsingør St. The train departs every 20 minutes and the trip takes 1 hour and 12 minutes. This train also stops at the Central Station so you can catch it there as well. The ship will be docked a 5 minute walk from Helsingør St. at Havnegade 1, Helsingør 3000. A group will be meeting at the Copenhagen Central Station at 7:00 am to take the train north together. Will I need to help cook and clean? The ship has a full catering team preparing food and clearing away. What activities are planned onboard? The vision for the voyage is to use the sailing activities to dictate the schedule (see the Christian Radich handbook). For those brave enough, there will be an opportunity to go up into the rig. The overall experience should feel quite serendipitous rather than adhere to a structured schedule. Different types of activities (e.g. discussions, songs, games that sailors facilitate) will be activated as the right moments arise. The ship has some tablets / patches that help prevent or reduce the effects of seasickness. While the ship is sailing, alcohol should not be consumed. Not for general use. There maybe times during the voyage when the mobile coverage is unavailable. The ship does have limited satellite capacity for emergencies. Please direct all practical questions regarding the voyage to postmaster@radich.no (and cc xvoyage@entrepreneurshipx.org so we can update this FAQ). 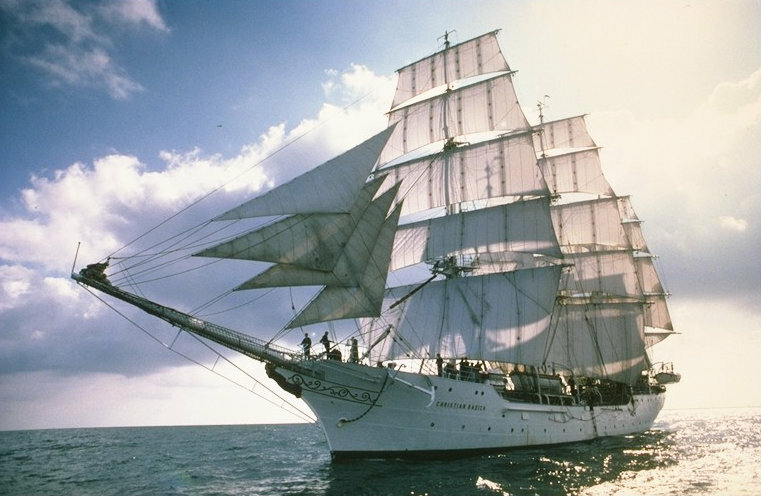 Welcome onboard one of the world`s most beautiful sailing ships! Not many can measure themselves against her, neither in size, beauty, nor qualities. 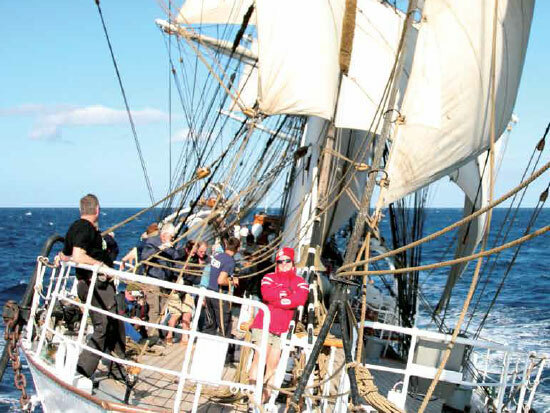 To participate on a voyage aboard the Christian Radich is an adventure, as well as an opportunity to learn something about the life onboard a sailing ship. And who knows, maybe an opportunity to learn something about yourself too? The look-out is posted on the forecastle or, in heavy weather, on the half deck. The look-out reports all objects sighted: boats, fishing equipment, wrecked-goods and other floating objects. The ship's bell is used to give signals to the helmsman. The helmsman is posted at the wheel on the quarter deck. He or she steers the ship under supervision from the ship's crew. Pay close attention to the compass course and do not engage in unnecessary conversation or become otherwise distracted from your duty. If you are in doubt about the ship's course or steering instructions, immediately contact the watch officer or any other crew member in the area.